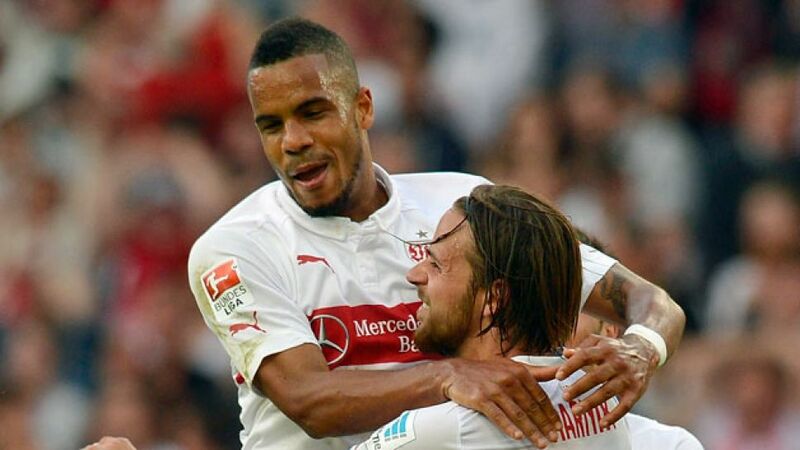 Stuttgart - The relegation plot thickened following rock-bottom VfB Stuttgart's pivotal 2-0 win over a 1. FSV Mainz 05 side that never really got started at the Mercedes-Benz Arena on Saturday evening. Daniel Didavi: "I think I had had a few sights of goals already and they didn’t come off, but when I had the chance in the second half I tried to play the ball, couldn’t see an option and decided to have a pop and it worked out rather well. Despite being out for so long I wasn’t scared of getting stuck in. The head coach [Huub Stevens] sees what I'm capable of on the training pitch and I'm glad to have been able to convert that into the type of performance I put in tonight. I'm still young and have had some injury setbacks. It's taken a little longer than I would have liked by now I'm pain-free. It’s a shame that I've missed so many games, but it makes it all the more special to make my comeback because football is something special to me. Serey Die was the best player on the pitch for me when our opponents were on the ball. He won so many tackles and it allowed our more advanced players to focus on closing down their defensive midfield. Tonight was a must-win." Martin Harnik: "The head coach kept asking whether I was ok to keep playing and I kept telling him I was fine. The only problem I had today were the flies, I think I swallowed about seven of them. In my mind it was only going one way today. We were so dominant and kept Mainz pinned back so much that I never had the feeling that we’d do anything but win. The game against Hamburg will be just like today. It’s about surviving in the Bundesliga and of course they have a head coach [Bruno Labbadia] who knows us very well." Christian Gentner: "Of course it’s a great feeling to win and celebrate with the fans, but there’s also a huge sense of relief. We had a quarter-final, semi-final and a final. We had to pick up a win to retain a chance of staying up. We’ve done that and our fate is still in our own hands. We’ve got to keep fighting, keep things tight and be clinical just like we did today. Didavi has an unbelievable quality. Its such a shame that he’s injured so often given his talent. You could see how well he fits in and how much better he makes us. I'm delighted for him." Sven Ulreich: "Keeping a clean sheet was definitely the key. In recent weeks we’ve given away too many silly goals and cocndeded far too often for our own liking. But I have to compliment my team for the performance today. We gave everything over the 90 minutes and throroughly deserved the win. We played the game down intelligently, even though it got a little nervy at the death. This is a full-on relegation battle that we’re involved in right now. But we’ve got to continue to perform with this type of passion and diligence and then I believe we can also beat Hamburg next weekend." Loris Karius: "I went to ground a little too early and the ball bounced higher than I anticipated which meant I could only get fingertips to it as it slipped over my hands. It was a silly mistake to make. Of course it’s a terrible feeling and I’m the only one to blame. We were lacking a bit of creativity. We didn’t do well when it came to creating chances. We were aiming to keep the game at 0-0 for as long as possible because we thought Stuttgart would open up as a result, but it didn’t play out that way. When you come up against sides like this who are fighting for their lives, and don’t match them in the fight, then you’re going to struggle." Nikolce Noveski: "We were far inferior in the first half but we pressed them better in the second half. It's a pity that we conceded the first goal then. We wanted to hold our own because we knew what we were coming up against, but we were inferior in every department."